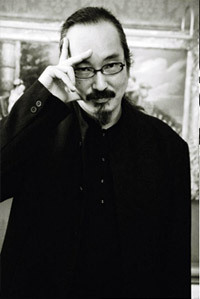 In memory of Satoshi Kon, master of animated dreams who untimely passed away on August 24, 2010, an exhibition of tribute drawings made by french artists was organized during the festivals "Japan Expo Sud" (February 2011 - Marseille, France), "Japan Expo 12th Impact" (July 2011 - Paris, France), "Japan Expo Centre" (October 2011 - Orléans, France) and "La Fete de l'Anim" (March 2012 - Lille/Tourcoing, France). We would like to thank Laurent Koffel (for his photographs of Satoshi Kon), Emmanuel Pettini and Ilan Nguyen (for their work on the Japanese translation), Maeva Poupard (for helping with the English translation), and Fuminori Hara (Madhouse). Marc Aguesse would also like to thank Elena Faure and Pierre-Alain Dufour from SEFA.